In his regular column, the BBC's environment analyst, Roger Harrabin, assesses the latest assault against carbon trading ahead of the Copenhagen climate conference. 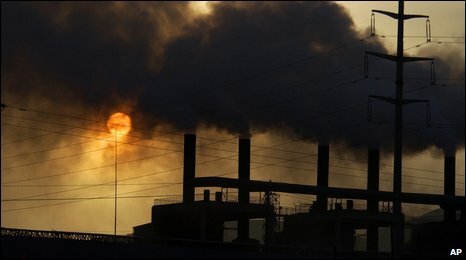 CARBON TRADING: DOES IT REALLY REDUCE EMISSIONS? Carbon trading could trigger a financial collapse like the sub-prime loans crisis, according to a new report from the green group Friends of the Earth (FoE). It is the latest in a series of assaults against carbon trading as the Copenhagen climate conference looms. The carbon trade allows dirty industries in rich countries to offset emissions targets by paying for clean development projects in poor countries. London is a major centre for the trade, which could reach trillions of dollars in the next few decades. But FoE says most trades are done not by polluting industries, but by speculative traders packaging carbon credits into complex financial products similar to those which triggered the sub-prime mortgage crash. It warns that this could lead to a future crisis of sub-prime carbon. The report's author, Sarah Jayne-Clifton, said: "Carbon trading is failing dismally at reducing emissions, yet allows speculators to grow rich from the climate crisis and hands politicians and industry a get-out clause for polluting business as usual." The allegation was instantly rejected by Patrick Birley from the European Climate Exchange, who accused Friends of the Earth of demonstrating a loose grasp of financial markets by relating carbon trading to complex sub-prime trading. "Carbon trading is a very simple trading tool much like trading in oil or gas," he said. He pointed out that carbon trading is merely a tool to achieve carbon caps set by governments. Friends of the Earth's rhetoric in this case might indeed be loose - but it is inarguable that confidence in carbon trading has been eroded after investigations showed that a substantial proportion of clean energy projects in developing countries funded by carbon finance had benefited business but not the environment. A recent report from Greenpeace focused on what it regards as a carbon trading failure in the Noel Kempff forestry project in Bolivia. Greenpeace says over the 12 years of the project, estimates of the emissions reduction have fallen almost 90%. The Bolivian government is now fervently anti-trading, insisting that rich nations should take responsibility for all their own emissions themselves. I also wrote recently in this column about the American Breakthrough Institute studies of carbon trading which concluded that a straight carbon tax (if ever it could be politically achieved) would be much more effective. The British government agrees that rich nations must make big emissions cuts - but insists emissions trading still has a cost-effective part to play. Indeed, the EU's promise of 30% emissions cuts if other nations agree tough targets is based on carbon trading. The US position relies heavily on carbon trading too - although right-wingers in the Senate insist it cannot be trusted. This is ironic given that it was free-market thinkers in the US who influenced the American government to insist that trading was part of the Kyoto climate deal, which the US subsequently rejected. Now the EU is flying the flag for trading, and assuming that it will provide much of the funding needed for adaptation and clean energy in developing countries. Having just returned from China, it is eminently clear that in theory it is much, much more efficient to provide clean infrastructure in a fast-emerging economy than in our sclerotic rich countries with so much of their energy infrastructure, factories and homes already set in concrete. But it will not work if people cannot trust the trade. On a previous visit to China I went to a wood-waste power station funded under the carbon trading scheme known as the CDM. It was obviously working well. But when I asked the owners if they had really needed the CDM cash to make the economics work, they repeatedly refused to answer. This touches on the principle known as additionality - ie, will a clean development project slow emissions growth in a way that would not have happened without it? This will have to be bolted down very firmly if agreement is to be reached on it in Copenhagen. When I ponder the cost of making my inherently leaky Victorian home in London properly energy-efficient, I cannot help thinking how much better it would be to spend that money insulating some of the Chinese buildings that are being hurled skywards as a breathtaking rate. But could you trust that the investment would happen in the right way? FoE is by no means alone in its scepticism.